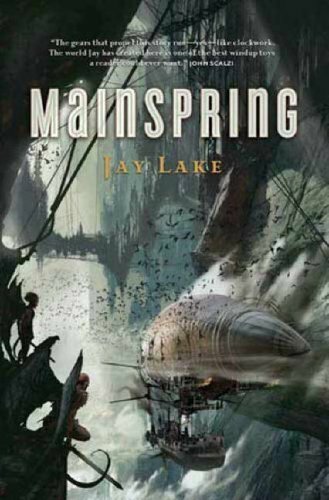 Jay Lake's first trade novel is an astounding work of creation. Lake has envisioned a clockwork solar system, where the planets move in a vast system of gears around the lamp of the Sun. It is a universe where the hand of the Creator is visible to anyone who simply looks up into the sky, and sees the track of the heavens, the wheels of the Moon, and the great Equatorial gears of the Earth itself. Mainspring is the story of a young clockmaker's apprentice, who is visited by the Archangel Gabriel. He is told that he must take the Key Perilous and rewind the Mainspring of the Earth. It is running down, and disaster to the planet will ensue if it's not rewound. From innocence and ignorance to power and self-knowledge, the young man will make the long and perilous journey to the South Polar Axis, to fulfill the commandment of his God.